A high school principal and vice principal in Hunan province were fired last month after it was discovered they had racked up an electricity bill of over 17,000 yuan ($2,440) from mining cryptocurrencies at work, local authorities told Caixin on Saturday. Lei Hua, the principal of Chenzhou’s Puman High School, began mining the cryptocurrency ethereum, or ether, in June 2017 at his home to make money. When he found that his single “miner,” a computer dedicated to mining cryptocurrencies, was burning through 21 kilowatt-hours of electricity a day, he moved his machine to the school. Over the following year, he added seven more miners and persuaded the vice principal, Wang Zhipeng, to buy one in December. After the mining operation began, teachers and students at the school complained of “strange noises” and slow internet connections, Caixin learned. One teacher said that the miners could even be heard in the school’s dormitories at night. Meanwhile, the school’s electricity consumption soared, with local media reporting that the miners cost the school an extra 17,158 yuan in electricity. According to the reports, when a school employee reported the abnormal electricity consumption to Lei, he claimed it was due to the overuse of heating and air conditioning units. The mining of cryptocurrencies, which are virtual digital currencies, requires a machine that uses vast amounts of computing power and electricity to solve the mathematical puzzles that power a cryptocurrency’s network. Miners are rewarded in new “coins” of the virtual currency, which can then be converted to hard currencies on overseas platforms. The first digital currency, bitcoin, was “dug out” in 2009, and since then the number of miners around the world has skyrocketed. Many countries, particularly China, have had a complicated relationship with cryptocurrencies. In September, China’s regulatory authorities banned virtual currency exchanges, and the regulation and tightening of cryptocurrencies in China has only increased since. In January, the Office of the Internet Financial Risk Regulation Leading Small Group issued documents to all localities, requesting that enterprises under its jurisdiction be actively guided to withdraw from bitcoin’s “mining” business in an orderly manner. But many civilian “miners” are still active. However, the profitability of cryptocurrency mining depends on the market value of the currency and electricity costs. 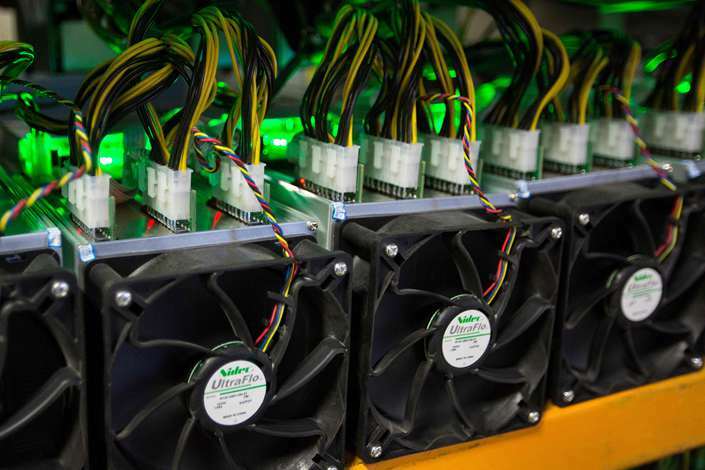 In its bourse filing, manufacturer of cryptocurrency miners BitMain said one of the major risks to its continuing business was its “ability to access large quantity of power at reasonable costs.” Additionally, it is increasingly difficult for low-powered mining operations to win big, as they will require more power over time as more competitors invest in increasingly efficient hardware, according to CoinDesk. The amount of ether that Lei and Wang mined has not been disclosed, though local media reports said that the county’s disciplinary commission seized the cryptocurrency earnings of both men. However, despite a boom in value late last year, the value of cryptocurrencies, including ether, have continuously fallen since the beginning of the year. On Nov. 12, ether’s price was $211, over $100 lower than its price in November 2017.